Enter information in one or more fields. All fields are not required. Partial information is ok. For example, searching for "Will" will find records for "William", and "24th Indiana" will find records containing "24th Indiana Artillery Battery". Note that the regiment search field only matches the beginning of the regiment name, otherwise a search for "9th Indiana Infantry" would return results in the 29th Indiana Infantry, as well as the 9th. Andersonville Prison, also known as Camp Sumter, is the most well-known and notorious of all the Civil War prisons, north and south. It was in operation from February 1864 until May 1865, and during that time over 42,000 men were interned there confined in only 23 acres of space. The peak population in 1864 was nearly 33,000 men. More than 12,000 prisoners died at Andersonville and are buried in the National Cemetery on the grounds. It is still an active military cemetery. 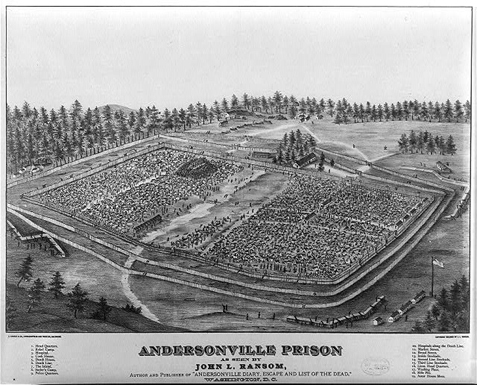 The site of the prison is now the Andersonville National Historic Site which is part of the U S. National Park Service. The Park's museum serves as a memorial to all American prisoners of war. National Archives: Selected Records of the War Department Commissary General of Prisoners Relating to Federal Prisoners of War Confined at Andersonville, GA, 1864-65; (National Archives Microfilm Publication M1303, 6 rolls); Records of the Commissary General of Prisoners, Record Group 249; National Archives, Washington, D. C.
Atwater Report: " List of Prisoners Who Died in 1864-65 at Andersonville Prison", compiled by Dorance Atwater, Second New York Cavalry, who was an Andersonville prisoner. First published in 1865.